The digital arc of this book was kindly provided by the publisher via Edelweiss+ website in exchange for an honest review. The main idea of this book is fascinating but the execution really fell flat, in my opinion. It was ridiculously over the top when it came to bullying, extremely simplistic when the friendship was concerned and just wasn't that interesting half the time. I did enjoy Rose's personality and her relationship with Princess Elizabeth; plus the book presented some great ideas overa The digital arc of this book was kindly provided by the publisher via Edelweiss+ website in exchange for an honest review. The Portal is the first book in Lasky's Tangled in Time series. I quite enjoyed the setting of Hatfield during the sixteenth century. There were nice tidbits of information from the time period, like how people might have brushed their teeth with twigs of bayberry and juniper. Lasky also incorporated photo's of time period clothing and shoes as well as portions of Rose's blog posts, diary entries and letters she shares with Franny into the story. Truthfully, if Rose spent the whole time in Engla The Portal is the first book in Lasky's Tangled in Time series. I quite enjoyed the setting of Hatfield during the sixteenth century. There were nice tidbits of information from the time period, like how people might have brushed their teeth with twigs of bayberry and juniper. Lasky also incorporated photo's of time period clothing and shoes as well as portions of Rose's blog posts, diary entries and letters she shares with Franny into the story. Truthfully, if Rose spent the whole time in England, I would have enjoyed the story so much more. It might have felt more magical. Rose never completely immersed herself into the time period. She straddled between the two, bringing the twenty-first century with her in her expressions and mannerisms. There also appeared to be many inconsistencies that stuck out to me, like how everyone in Hatfield took Rose so literally at her words and that they don't really question her use of common twenty-first-century phrases as being odd, they just seem to gloss over them. Even Rose's actions aren't consistent, one minute Rose is reprimanding Elizabeth for her demeaning remarks to a chambermaid and then herself refers to Princess Mary as "snailhead." Then there was the trio of means girls, who just seemed unnecessarily mean. Perhaps if the message was consistently made that all forms of bullying are wrong it would have worked better for me. Lastly, I found that I wanted to know more about Rose's grandmother. She seemed like such a sweet elderly lady. But why would she be put in charge of Rose's care? Despite having the financial means, is this really the best option? Most of the time she needed to be reminded who Rose was, unless she was in the greenhouse and then she excelled at recalling everything about caring for her plants and flowers. I probably spent way to much time thinking about what Rose's future would be like and so I don't think I was as vested as I could have been in figuring out who Rose's father was. Or maybe it was that everything seemed to come together rather quickly. 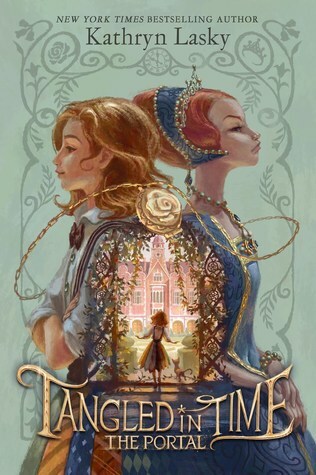 The story ends with an epilogue that hints to the direction that future time travels will take Rose and am curious enough that I will keep an eye out for the next book in the series. Kathryn Lasky - Kathryn Lasky is the American author of many critically acclaimed books, including several Dear America books, several Royal Diaries books, 1984 Newbery Honor winning Sugaring Time, The Night Journey, and the Guardians of Ga'Hoole series. Book 15, The War of the Ember, is currently the last book in the Ga'Hoole series. The Rise of a Legend is the 16th book but is a prequel to the series. Lasky has also written Guide Book To The Great Tree and Lost Tales Of Ga'Hoole which are companion books.